The O'Reilly `short cut' ebooks are a new thing to me, and I'm not entirely convinced by the format as I prefer to have a proper book in my hands, but for a low price ($9.99 as a PDF, plus the cost of printing/binding if you want a hard copy) it's a novel way to approach small or niche topics which don't justify an entire book. 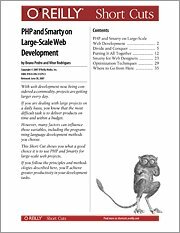 Using PHP and Smarty for large scale web development is just such a topic, and one which I'm keen to learn more about, so I was pleased to have the chance to dive into this text. To begin with, I was a little disappointed to see several pages devoted to introducing PHP and giving reasons why you should use it for web development. Presumably anyone reading this book is already interested in using PHP for large scale web development, so I'm not sure what the point of this entry-level information is. Such an introduction might be forgiveable in a full-length book, but in a self-proclaimed `short cut' I expect to get straight down to the detail of the topic without any preliminary waffling. At just under a third of the way through the book (after the lengthy introduction), the authors finally start to show some PHP and Smarty code, albeit with a very simple example which doesn't seem to have any relation to large scale web development. The authors then go off at a tangent to discuss using mod_rewrite to create `nice-looking' URLs and some of the Smarty configuration variables, but there is no real explanation of how to use them. After meandering through a basic Smarty tutorial, you will finally come across some useful information about techniques such as caching, but the book ends rather abruptly with some general pointers to further topics such as version control and unit testing. Overall, this book probably won't tell you anything that you can't find out for yourself by a quick search on Google, which is disappointing really. The first thirty pages tell you about how to use PHP and Smarty, but it's only in the last eight or nine pages where you actually find some material which is relevant to large scale web development. Even at the low price which these ebooks at offered at, I can't recommend this text as it simply doesn't cover the subject which it claims to in the title.